In my introduction, I want to focus on two aspects of this issue of The Journal of Somaesthetics: first, to describe the picture an open issue paints of the current field of somaesthetics, and secondly, to discuss the Nordic component of this issue. The first issue of 2018 is an open issue without any thematic focus except that the articles have to position themselves within the theoretical or pragmatic field of somaesthetics. It is based on an open call with the intent to explore the field of somaesthetics from various angles. The majority of contributions in one way or another deal with art. Of course, this should not come as a surprise, because aesthetics has been connected to art reception since the modern rise of aesthetics as a scholarly field coincided with the modern rise of the autonomy of art. More recent developments in contemporary aesthetics have sought to bring aesthetics back to its original broader conception as concerned with sense-making and appreciation that finds expression in all of life’s domains. This development, however, has mainly been analyzed through objects – art and design artefacts, and seldomly by tracing human sense-perception and anthropological research. In this context, the concept of somaesthetics proves important, because it focuses on the aesthetic experience of the soma, the living, perceiving, purposive body, as an integrated aspect of aesthetic experience and a medium of research. Concurrently, the field of artistic research and arts-informed academic inquiry is rapidly expanding, yielding novel approaches and a renewed debate about how we should understand the notion of knowledge in aesthetics, in its academic and artistic ramifications. The vocabulary of somaesthetics seems to be able to embrace and facilitate this novel demand to aesthetics and knowledge. In addition to this expansion of the aesthetic field, there can be seen another closely related development. As art increasingly embraces audience activation converting audiences from contemplating onlookers to participants and co-creators, so the field of aesthetics must consider the active participant as intrinsic part of the work of art transforming art into events of experience and consumption in line with other cultural artefacts and events. Seen in this light, aesthetics has to enlarge its methodical tool box towards a thinking through and with the soma as a perceptual and sense-making ‘organ’ in order to be able to capture the experiential, creative, and ameliorative dimension – not only of art making and art perception, but also of other cultural fields that rely on aesthetic perception. 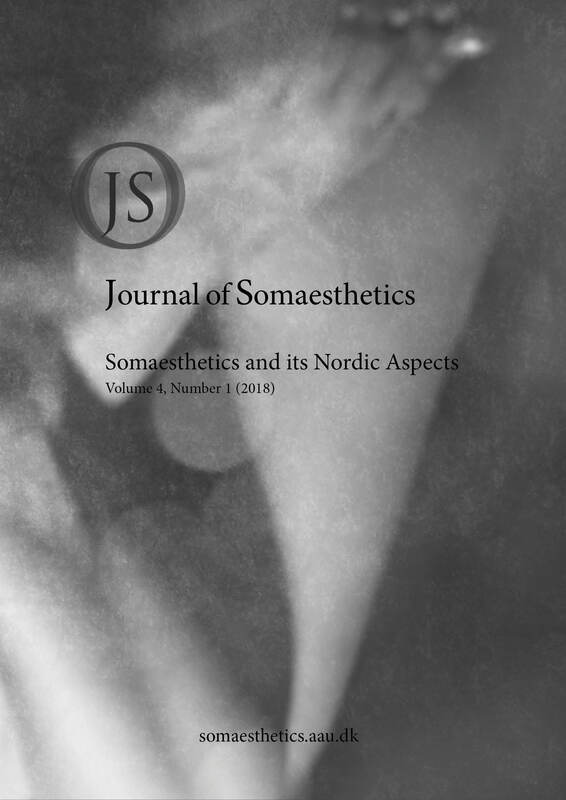 The second point I wish to mention is that The Journal of Somaesthetics, founded from the outset in Aalborg University, Denmark, is now in a period of reorganization to emphasize its Nordic dimension by establishing a predominately Nordic editorial board. We hope this will strengthen the Journal’s contribution to presenting Nordic approaches to the many topics and applications of somaesthetics, but we aim to do so by also engaging with and publishing the best research in somaesthetics from scholars in the wider international research community. Although it is hard to generalize, Nordic research has a distinctive take on questions concerning somaesthetics because of certain features of Nordic culture and Nordic academic histories, practices, and aims. Noticeable is the interest for letting somaesthetic theory and concrete somatic practices permeate each other. The idea here is not simply practice as a mechanical application of somaesthetic ideas and concepts, but rather an academic research from within framed and observed, but always experienced practices. Practice should here be understood as either the investigatory measurements and activities of distinct professions and fields of research and/or the compassionate but analytical observation of and interaction with professional or everyday actions of distinct social groups. It is not surprising that in recent years there have been a significant number of research-oriented practical workshops in somaesthetics in Nordic countries. One of this issue’s authors write from within the field of art and art research: Rasmus Ölme, a dancer and researcher, writes in his article “Suspension” about his practice-based research on the materiality and immateriality of movement, thereby investigating the performative relationship between the cognitive and sensory, movement and space, and artistic experience and academic theoretical conceptualization. My own article, “Into the Woods with Heidegger” can be categorized as arts-informed, academic research in that it is a reflection on an autoethnographic project documenting my encounter with some passages of Heidegger’s essay “The Origin of the Artwork” while helping an artist constructing a land-art piece. The project’s aim was to find common grounds between art theoretical and artist-practical work. The encounter has led me to the question, whether the soma harbors inherently ameliorable capacities via bodily self-reflections or whether the body merely is a performative machine for very disparate ideological content. In her article “Care of the Self, Somaesthetics and Drug Addiction: An Exploration of Approaching and Treating Problematic Use in Non-Coercive Settings”, Riikka Perala reflects on her work with drug addicts in the context of the Finnish social system. She proposes a somaesthetic understanding of drug addicts as full members of our societies and of everyday life. By shifting from the idea of drug addiction as an illness towards drug addiction as a (hopefully temporary) life condition, she suggests that harm reduction measurements can be seen in a Foucauldian light of “care of the self” and that somaesthetic awareness can occasion more positive ways of living and better tackle the addiction. We also find in this issue Nordic contributions that take on more traditional topics of aesthetics. Martin Ejsing Christensen’s article analyzes Dewey’s idea of doing philosophy as an aesthetic, experiential practice by comparing it with Richard Shusterman’s idea of somaesthetics, and he implicitly transforms his writing of the article into an aesthetic experience. Finally, Martin Jay and Ronald Shusterman use ideas from somaesthetics as tools in analyzing various musical and visual art works. In a short article, Martin Jay describes Ken Ueno’s work Jericho Mouth with Barthes’ distinction between pheno- and geno-song, the former being in the service of representation and communication, the latter as somaesthetic performance from a pre-subjective depth. Ronald Shusterman’s looks at the deterritorializing ambition and effect of a selection of urban artworks that disturb the familiarity of and expectations of shared social space and urban order. He argues for a metaethical effect of these works, because their perception constitutes a transitional passage because expected orders are momentarily annulled, the emerging void asks for an altered view and another perception of urban spaces. These moments of singularities are like jokes and laughter, opening an abys.